Locations--as mandated by CA state law--there are 1.5 In-N-Out shops for every Starbucks, so swing a cat, and you'll hit one. OK, In-N-Out is considered pretty darn good, but have you ever tried one without all the toppings? I did--bun, meat, cheese, and you know what--it sort of sucked. I'm bummed, because this was one of my favorites before I tried some good cheeseburgers. Ignorance was bliss. The butter on the toasted bun overwhelmed the other flavors....at first. 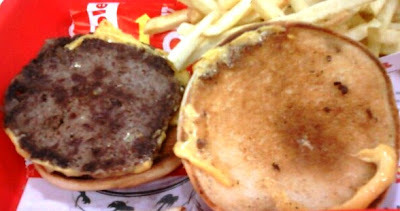 The beef was rubbery, bland, and thoroughly overcooked--the texture and crunch came from the bun. It was dry--this burger actually needed the toppings to make it moist enough to get down without a lot of beverage. It was salty as hell. That's about all that I tasted--salt and butter. Without that Thousand Island sauce to provide a sweet counterpoint, this was an overly salty dish. The beef had no aged or iron notes to provide even a little complexity. It's too bad that the Secret Menu didn't have a "good burger" option. The fries were miserable. Mealy, mealy, mealy, rubbery, and limp. From a purist point of view--In-N-Out burgers are a pass. PS--the fries are much better at Five Guys, too. Burger Review : Not great. Heresy? 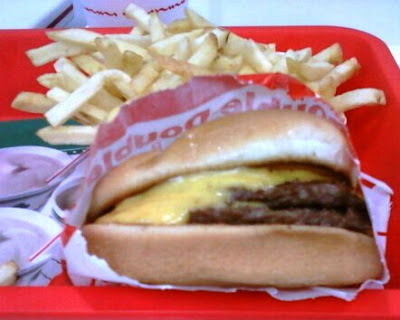 Lots of us who've lived elsewhere at least as long as we've lived in California think of the INO burger as only marginally better than McDonald's and the fries as the primary reason most INO executives will pass through neither the eye of a needle nor the Gates of Heaven. I wouldn't want to defend serving those often-beautiful and -crisp sticks of cardboard to the public. I worked at In N Out for over 13 years. French Fries are not frozen or twice cooked(ie:blanched) They are made from real potatoes on the spot. They are best eaten straight away and you can ask for them to be fried medium well. (if well done they come out hard) They do not use butter to toast buns. Youu can ask for meat no salt and then salt it to your liking. They don't use thousand island. They use a dressing similar to Thousand Island. They only use grain fed cattle for their meat. It is possible to ask for meat to be cooked as well as desired. The buns are real sponge dough. I love In N Out although they are not perfect. I feel they are the best burger that I can get for the price and convenience. And just in case any one is wondering it has been 25 years since I worked their. And by the way when I worked their we steam cleaned the kitchen once a month.